Smog threatens surveillance in several Chinese cities. 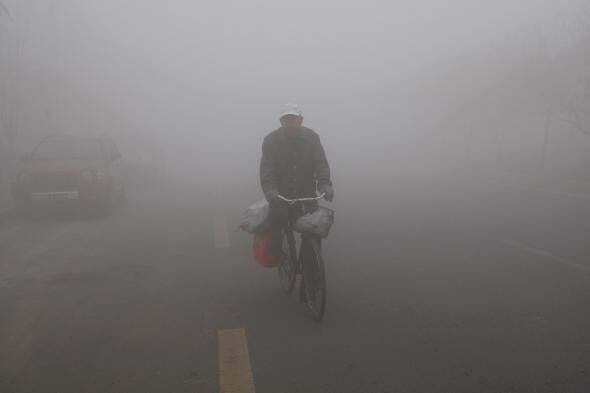 A man cycles in the smog in Harbin, a city in northeast China. The smog that shrouds many of China’s cities makes regular headlines. Pollution has halved tourism to Beijing, devastated the health of its citizens, and now, undermined the surveillance state. The dense haze surrounding many of China’s northern cities, like Harbin, makes it hard to see more than three meters on a bad day, but according to the South China Morning Post, it also renders the average security camera useless. Smog now blocks light almost as effectively as a blanket over the lens. China has long been very enthusiastic about security cameras. Since 2005, the government has rolled out surveillance in public places, parks, and even on buses and in classrooms, as part of an operation called “Skynet”. (AS NPR noted in a report on this growing surveillance,”‘Skynet’ is also the name of the computer system in the Terminator films that attacks mankind.”) Some estimate that there are about 30 million cameras operating in China—that’s one for every 43 citizens. The ineffectiveness of this all-seeing eye is bad news for the state. National security forces were on alert after a car bombing last week in Beijing’s Tiananmen Square, and the South China Morning Post said that authorities feared smog would be used as effective cover for terrorist attacks. But this blow to successful spying doesn’t seem like it will be the catalyst the government needs to put together an effective program to reduce pollution. It’s instead commissioned two teams, one civilian and one military, to find a solution—most likely more effective camera software. Perhaps they should just buy that smog vacuum cleaner everyone’s talking about.